Note: In some official railway publications the station has been referred to as Newbiggin-by-the-Sea, for example in the Railway Clearing House Handbook and on Lance Cattermole’s BR (NE) poster map of Northumberland published in 1949. The longer version of the name was also used on some tickets. Newbiggin was a mining village and aspiring coastal resort when the railway arrived in 1872. In 1911 the NER recorded the station’s catchment population as 3,736, and by 1951 Newbiggin was a town of a little over 10,000 people. Venetian window on the east wing. These window styles were repeated, with minor variations, on the road frontage. Door openings had restrained gothic arches. An open-fronted verandah -removed by 1962- stretched between the cross wings. The main platform (about 200yd) and bay (about 120yd) received a narrow 43yd extension in 1902 to accommodate longer excursion trains. The signal box was about 100yd west of the station, south of the running lines and adjacent to a siding which served a turntable. The goods facilities included a one-ton crane; a range of goods could be handled but (in 1913) potatoes and livestock were the principal traffic. Documents held in the National Archive, Kew, reveal that in 1924 the LNER planned additional capacity. Scheme 1 would double the line to Woodhorn (one mile west of Newbiggin) and create a new station with two curving 130yd platforms on sidings north-west of the original station. The main building, reached by a new approach road, would be on the up platform, with a waiting shed on the other platform. Scheme 2 was to add a 200yd platform opposite, but displaced westwards from, the existing main platform. Neither scheme was adopted. After closure in 1964 the tracks were removed between Newbiggin and Woodhorn, and the station site was cleared by the mid-1970s. Clayton steam railcars in NE England. They operated on the former B&T lines; the Sentinel Phenomena spent its working life plying mainly between Blyth, Morpeth, and Monkseaton. From 1937 G5 ‘Push and Pull’ operations were re-introduced, and steam railcars were abandoned by 1948. Passenger services to Blyth and Newbiggin were dieselised in September 1958. However the 5:30 am parcels train ex-Newcastle, returning as the 7:35 am ex-Newbiggin remained steam-hauled. from Britain’s railways. The ex-B&T system was no exception, with goods handling ceasing at all stations in 1963-65. 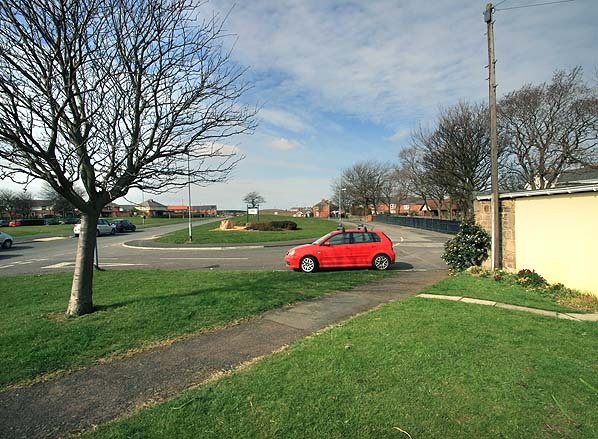 Bedlington handled parcels traffic until 1966. By 1990 only coal, alumina, and aluminium were carried. West Blyth staiths closed in 1989, and a new facility opened at Bates in 1991. In 1980 a new curve between Hepscott North and Morpeth North junctions allowed direct access to and from Scotland. Former double-track sections were singled: Bedlington-Choppington (1973) and Newsham-Backworth (1985). Since 1980 anew single-track has allowed independent working from Backworth to Benton Quarry on the ECML, avoiding conflict with Metro services. The B&T system’s layout allowed many permutations of passenger train services, and these changed over the years. Bradshaw of April 1910 showed an exceedingly complex set of train workings. estimated at £22, but income could be derived from letting the general and ladies’ rooms at Choppington and Hepscott. Bedlington UDC’s suggestion that reduced fares would attract custom found no favour with BR who withdrew the passenger train 1950. In the final months the two regular passengers were lavishly provided with three or four suburban coaches. How things had changed from 1911 when the intermediate station at Choppington issued almost 116,000 tickets. By summer 1950 the B&T timetable was threadbare between weekday morning and evening peak hours; Monkseaton-Blyth, for instance, had no service between the 9:12 am ex-Monkseaton and 4:40 pm ex-Blyth. Saturday trains were more numerous, as in previous years, catering for shopping and leisure journeys. 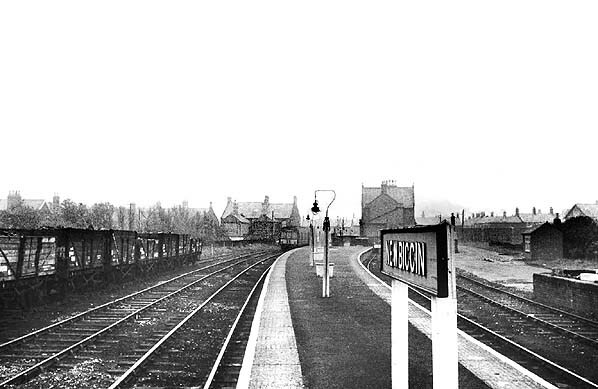 From January 1955 the services were focussed on Monkseaton, to reduce operating costs and improve connections to north Tyneside suburban coastal stations. 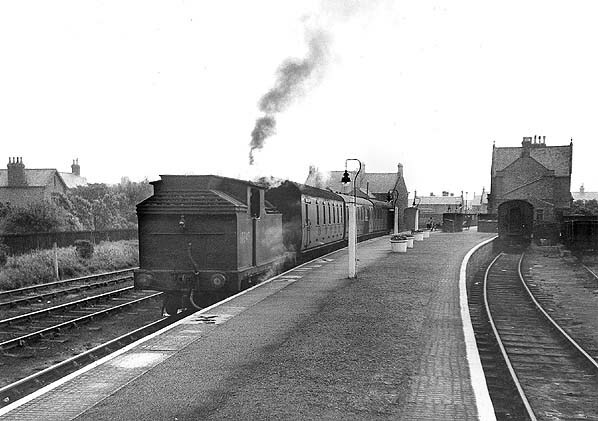 After diesel multiple units were introduced in June 1958, a regular interval hourly Saturday service was introduced of trains between Monkseaton and Blyth connecting at Newsham with Manors – Newbiggin trains, which themselves connected with Newsham – Blyth trains. The revised B&T weekday and Saturday services differed enough to require separate listings in the NE Region timetable. Sunday trains were withdrawn by summer 1954.
the ‘closure culture’ was strong –not least among BR senior officials. The enhanced Saturday service, introduced in 1958, had not produced the substantial increase in passenger use that had been hoped for, and in the early 1960s there seemed to be no inclination to make further improvements or effect economies by de-staffing stations. The concept of ‘park-and-ride’ stations was in its infancy at that time, with consideration being given to providing such a facility at Forest Hall, on the East Coast main line and at New Pudsey in Yorkshire – the latter was opened in 1967. 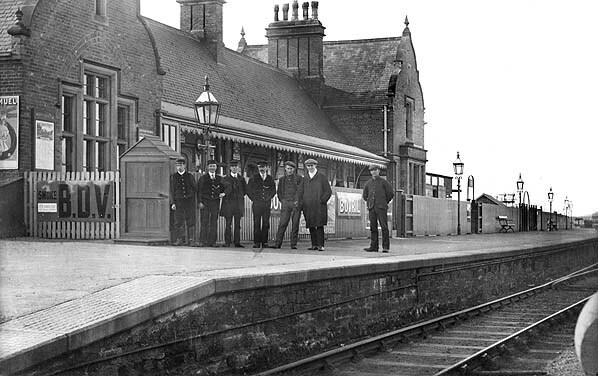 However there is no evidence that such stations were ever proposed for the Newbiggin / Blyth lines. This was the most elaborate station building on the northern part of the Blyth & Tyne system. It dated from 1872, by which time the B&T had recently ‘raised its game’ with some attractive stations on the Newcastle extension of 1864. Newbiggin’s Dutch gables with stone finials and the coupled chimney stacks were thought appropriate for the aspiring holiday resort. Only a narrow verandah was provided to shelter the crowds, but a sturdy wooden fence was installed to prevent them from spilling uncontrollably onto the platform. This view is looking west c1910. 1897 1:2500 OS Map. 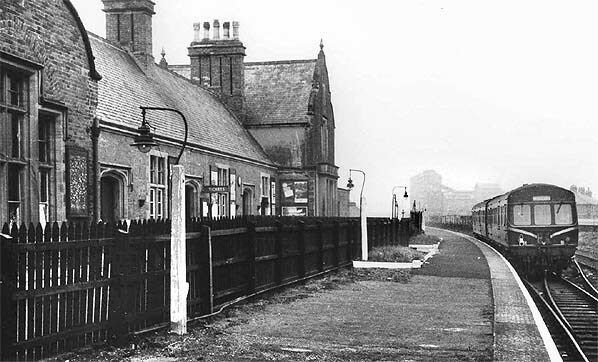 Little urban development had taken place at Newbiggin by this time, although the station had been open for 25 years. 1924 1:2500 OS Map. Note the development of sidings associated with coal and gas production. The LNER planned in 1924 to increase the capacity of the passenger station; one solution was building platforms on the curved sidings leading to the gasworks to supplement the existing station. The plan was not implemented. 1958 1:2500 OS Map. There are still many sidings in the vicinity of Newbiggin station testifying to the importance of mineral traffic on the branch. Urban development encloses the station site. 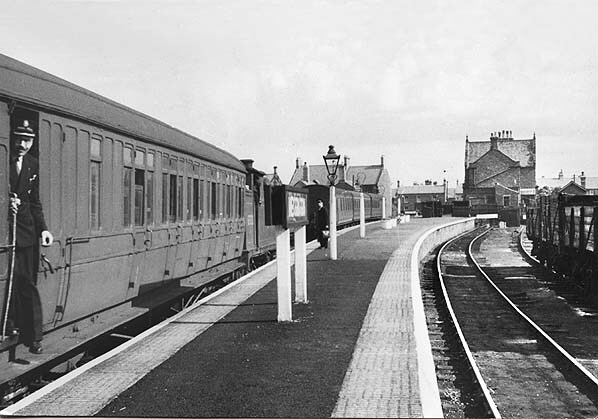 In July 1949 a four-coach passenger train prepares to leave Newbiggin. Some coal trucks have been left in the goods sidings (extreme right). Looking west at Newbiggin in the 1950s a loco is running round its train. The leading coach is fitted for push-and-pull operation. The town’s colliery is in the background. 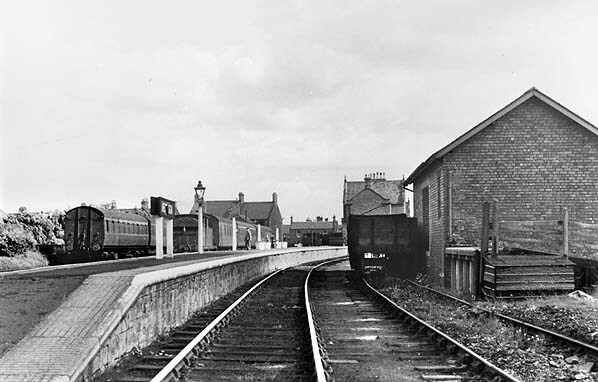 Newbiggin station looking east in September 1955. While a passenger service stands at the northern face of the island platform, empty coaches occupy a siding beyond. There is little activity in the two goods sidings (right). 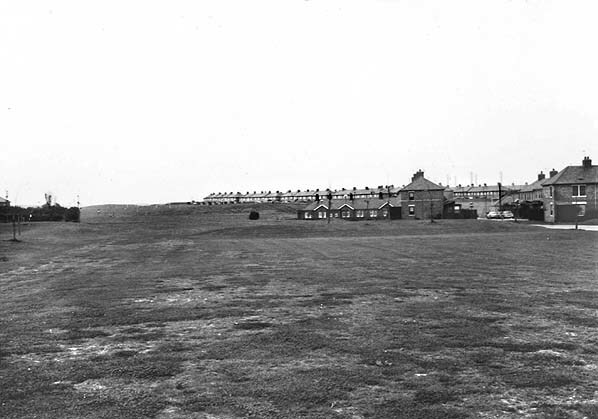 Looking east at Newbiggin in September 1955. Although of generous length so that excursion trains can be accommodated, the single island platform at Newbiggin is unusually narrow. In 1924 the LNER proposed to expand the station’s capacity, but neither of its two plans was carried out. Here we see several coaches occupying the eastern part of the main platform, whilst a passenger train has arrived at its western end. One of the two goods sidings is in use by coal trucks. 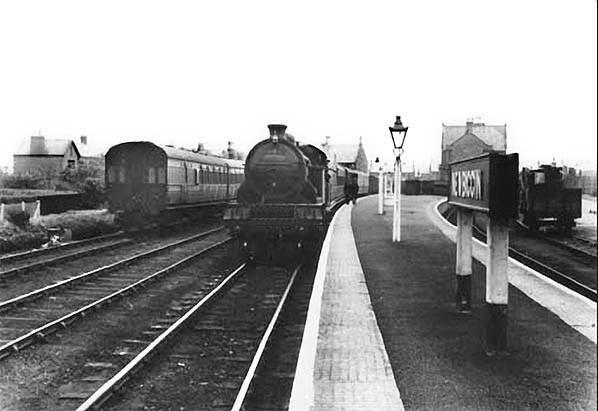 Newbiggin station, looking east in 1956. 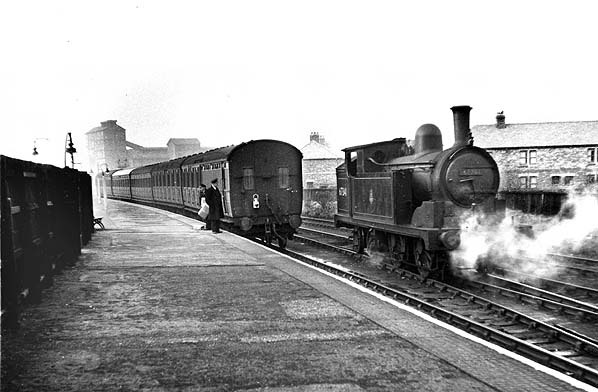 In February 1957 a push-pull train prepares to leave Newbiggin. 67341 was built at Darlington works in 1901 to a design by Wilson Worsdell for the NER. Carrying the number 384, this 0-4-4 tank was intended for suburban passenger work at which it was very successful, so much so that the 110 locos built in the 1900s all passed to BR ownership in 1948. This loco was renumbered by the LNER to 7341 in 1946 before passing to BR and lasting almost another ten years before being withdrawn from 53A, Hull Dairycoates shed in November 1958. 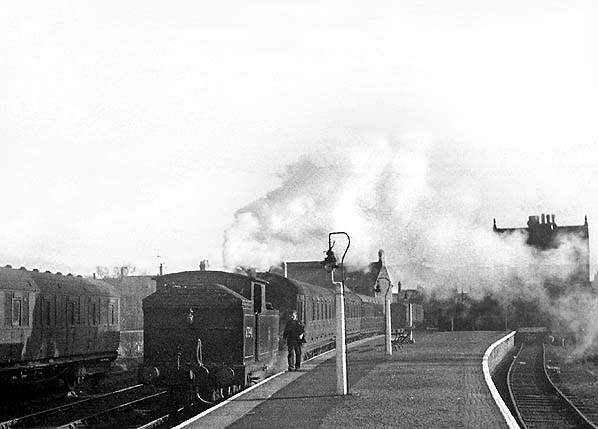 In this at Newbiggin in 1962, a DMU is occupying the eastern end of the main platform. Little investment has been made in the station facilities, with gas lighting in use on the platforms and an LNER nameboard in place. The considerable length of this platform was required to accommodate excursion trains before World War II. 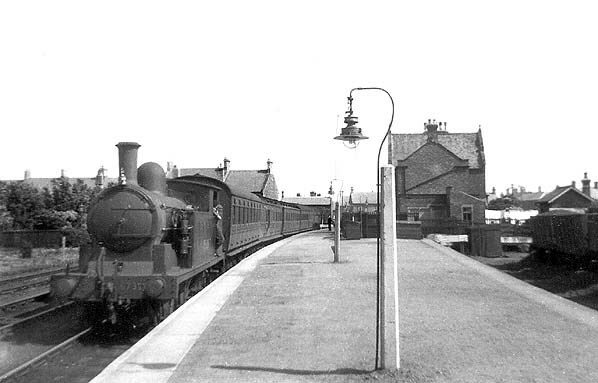 From 1958 DMUs replaced steam on the Newbiggin line. In 1962 a Metro Cammell multiple unit with ‘whiskers’ painted on the cab awaits passengers. The design of the building, one of the last to be constructed by the Blyth & Tyne before it was absorbed by the North Eastern Railway, was attractive incorporating Dutch gables and Gothic door cases. 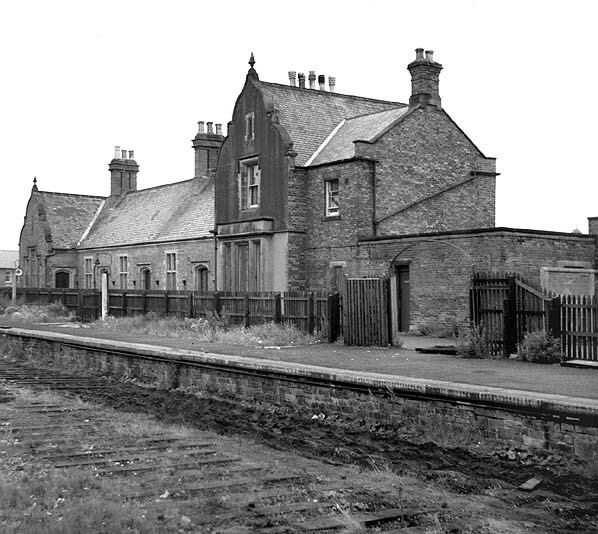 Newbiggin station closed to all traffic in November 1964, and the tracks were already removed by August 1965 when this photograph was taken. The fine station building has lost the small verandah between the two pavilions, but it is otherwise intact and looks eminently suitable for conversion into residential use; unfortunately it was demolished instead. The site of Newbiggin station looking north-west in March 2009.